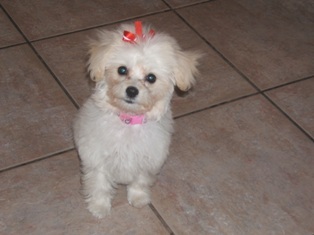 Daisi is a full breed Maltese puppy, in this picture she was 7 months now she is 9 months. She is smart loving and just fun to be around. She really brighten me and my husbands day. When I saw her in a pet store sleeping I had to have her. Having her as a part of the family was the best decision we could have made, Maltese is a great breed. Join in and write your own page! It's easy to do. How? 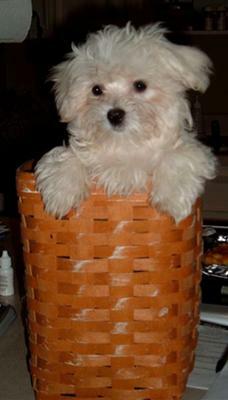 Simply click here to return to Tell Us About Your Maltese Puppy!. 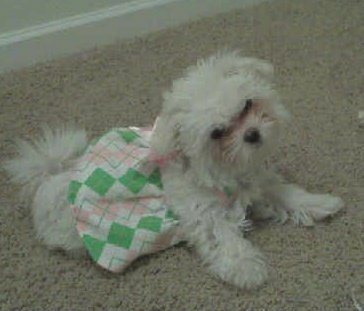 My Maltese puppy Chloe is a year old now. She completed puppy school when she was 5 months old and still remembers everything! She can sit, lay down, stay, roll over, drop it and is an AWESOME fetcher! She sleeps by my feet every night and is just a sweetheart. Everyone who sees her falls in love. she is so sweet and has the same name as my Malshi pup! Gorgeous! Our Maltese puppy Lady is by far the most intelligent dog I have ever had. She lives to play fetch with all her little toy stuffed animals. She has a whole little toy box and by the end of every day every toy she has (which is alot) are scattered throughout the house and yard. She is so playful! She is also a little cuddler and loves our affection. I just had a baby in November 09 and she is great with him too. 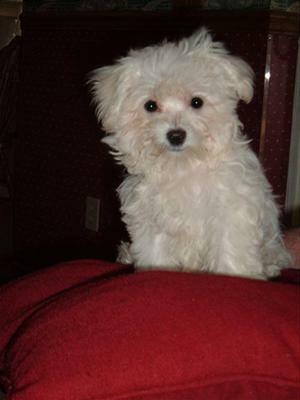 Anyone who does not have one of these precious Maltese dogs really should consider getting one. He's the light of my life... LOVES to play with other dogs, and has no fear! He's the smartest little guy, and has already learned basic commands, at 13 weeks. He is proud to be on Maltese Maniac!